I can’t tell you how many times I heard Chinese people say this to me the week leading up to my summit of Hua Shan. Literally every person I told about my planned climb told me of the perils that are involved in climbing Shaanxi’s sacred mountain. At the time, I thought everybody was freaking out over nothing. I figured that their warnings about Hua Shan were the same kind of warnings as “don’t drink cold water” or “be careful of the bright sun today” that I often hear from Chinese people. Seriously, how dangerous could the climb be? Five hours after beginning my hike from the bottom of Hua Shan, as I sat shivering atop the East Peak waiting for the sun to rise, I understood why so many Chinese people had warned me about the climb. Climbing Hua Shan is indeed one of the craziest things I’ve ever done! There were countless times throughout the trek up Hua Shan where I could not believe how steep and dangerous the trail was. Anyone who has climbed Hua Shan knows what I’m talking about. If you haven’t been to the mountain, type the words “Hua Shan dangerous hiking trail” into Google and you will see that Hua Shan is widely regarded as the most dangerous hiking trail in the world. Hua Shan reputation’s as a treacherous mountain climb is well deserved. Although many of the stair case trails are almost 90 degrees vertical, you are not hooked into safety ropes or carabineers. Instead, you simply hold onto handrails and thick chains that snake up and down each walking trail. These rails and chains are often the only thing keeping weary climbers from tumbling down the mountain. Although climbing Hua Shan is an intense physical experience, that doesn’t mean that only professional climbers or trained athletes can scale the mountain. Anyone in decent physical shape and in a comfortable pair of walking shoes can journey from the base of the mountain to the East Peak for the morning sunrise. Trekking Hua Shan at night and seeing the sunrise from atop the mountain’s East Peak is the most popular way for tourists to experience the mountain. It seems rather counter-intuitive to climb a mountain at night, and honestly it is a strange endeavor. The first hour or so after going through the entrance at the bottom of the mountain is easy enough. It is simply a paved walking trail winding up and up. But after about an hour or an hour and a half, the stair climbing begins. If you get tired climbing the stairs to get to your fifth floor apartment, you probably need to train a bit more before attempting an ascent of Hua Shan. Scaling Hua Shan involves walking up thousands upon thousands of stairs. You literally just walk from one set of stairs to another. Many of the paths are hundreds of feet of stairs at imposing 80-degree angles. After an hour or two of stair climbing, I began wondering whether the stairs would ever end. The stairs going straight up do in fact end. After reaching the North Peak, about three or four hours into the climb, things really open up and the paths become more manageable. If you’re lucky enough to climb Hua Shan on a clear night, viewing the stars from the North Peak is something you’ll never forget. I vividly remember the adrenaline pumping through my veins, the delirium I had from exerting myself so hard in the wee hours of the morning, and the rush that came from viewing the stars from atop a sacred holy mountain in China. This euphoria is something that I’ll remember for the rest of my life. It was almost too much for my brain to process. After reaching the North Peak, it isn’t too much farther to the East Peak and the most scenic place to view the sunrise. The path from the North Peak to the East peak is not as rigorous as sections below the North Peak. But these sections seem as difficult to a fatigued body that has been climbing stairs for hours. The energy invested into reaching the East Peak makes finally getting there a remarkable experience. Hordes of tourists all hold up their cameras and cell phones to catch the sun as it comes into view over the horizon. The wind-swept mountains beneath the fiery morning sun make for great photographs indeed. Hua Shan is a one-of-a-kind place not only because of the experience of climbing a mountain at night and the physical beauty encapsulated by the view of the orange sun rise over the jagged scenery of Hua Shan’s East Peak, but it is also an amazing place to visit because of the rich history that has played out amidst its peaks and valleys for millenia. Having a basic knowledge of the history of the mountain makes the trip to Hua Shan that much more enjoyable. 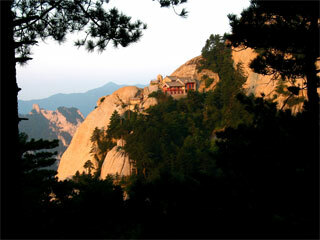 Hua Shan is the western most of the five sacred Taoist mountains in China. Lao Zi, the founder of Taoism, lived and studied on the mountain. 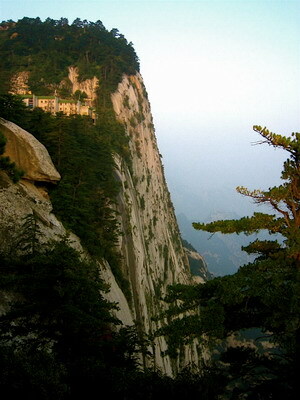 In fact, Taoism has such a long and storied tradition on Hua Shan that an original sect of Taoism – the Hua Shan sect – was formed from within the temples of the mountain. Because of this sacred history, pilgrims have made journeys to the mountain for centuries. In addition to being a storied religious site, China’s emperors have been enthralled with Hua Shan for more than two thousand years as well. Emperor Qin, the emperor who built the terracotta army, designated Hua Shan as an official sacrificial site. It is said that this tradition continued for centuries and that several emperors throughout the course of hundreds of years climbed Hua Shan with the hopes of gaining good fortune. Today, this history is preserved by over 120 protected temples, buildings and, caves throughout the mountain. Simply, Hua Shan is one of the most unique places on Earth. Any person living, traveling, or working in Xi’an should visit Hua Shan. Its history, its scenery, and the triumph of reaching the apex of Hua Shan’s summit are unparalleled by any other place or experience in the world. Buses to Hua Shan leave the parking lot of the train station frequently throughout the day. 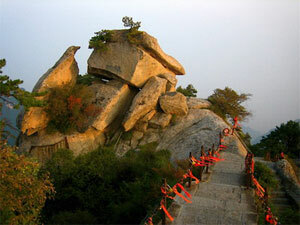 The trip takes about two hours and should cost around 25RMB. Buses come back to Xi’an from the village at the foot of Hua Shan throughout the day for around 25RMB. It is also possible to catch a train from Xi’an to Huayin Xian. From the train station, you will need to take a bus to the village at the foot of the mountain. Admission to mountain is 100RMB. The ticket booth at the base of the mountain is open 24 hours a day. If you want to skip climbing the mountain at night and take the cable care instead, you need to take a bus from the village beneath the mountain to the East Gate. Tickets to the cable car to the North Peak cost 60RMB each way in addition to the 100RMB entrance ticket. The cable car begins running at 7:00AM and stops at 7:00PM. There are small restaurants and places to eat every fifteen minutes or so as you climb up the mountain. Don’t expect much though. But bowls of noodles, tea, water and other snack foods are abundant throughout the mountain. There are places to stay both in the village at the base of the mountain as well as a few hotels atop the mountain. Don’t expect anything more than an uncomfortable bed and a dingy bathroom at any of the guesthouses though.